The last time I posted here, I was lamenting on how little time I had to update. That was before I returned to work and discovered that if I thought I had little opportunity for, well, anything before... Once numbered again amongst the gainfully employed, I'd have absolutely no time at all! And that dear reader is why this blog has remained silent so long. There have been moments when I had something to write. I may even have been near a computer, but I haven't had the time to do much more than work, deal with some very unpleasant work related fallout and look after baby. In those rare moments I have managed to turn my thoughts to something creative, trying to write about it or photograph it, let alone actually get the photographs onto a computer have become incredibly challenging. So, please bear with me for this post which I started back in early February! Christmas and early January flew by, lost somewhere in the preparation for returning to work. Christmas itself was good, with the present aspect of things dragged out well into the New Year as we only opened a few of M's gifts each day so that she had time to appreciate each new toy. By the end of the Christmas season, M had become an expert present unwrapper and learnt a new skill, that of ripping things. This new skill transferred well to many things, but most successfully onto paper and food. Wrapping paper was also a great hit and in M's eyes, as much fun as the gift it concealed. She liked hiding under it, crinkling it, waving it, ripping it and of course nomming it. With Christmas out of the way, preparation for my return to work stepped up and I spent a couple of hours at the nursery every day, settling M in, which pretty much took up all of my remaining maternity leave. I did make a couple of hats as Christmas presents, but just didn't get a chance to photograph them before passing them to their new owners. 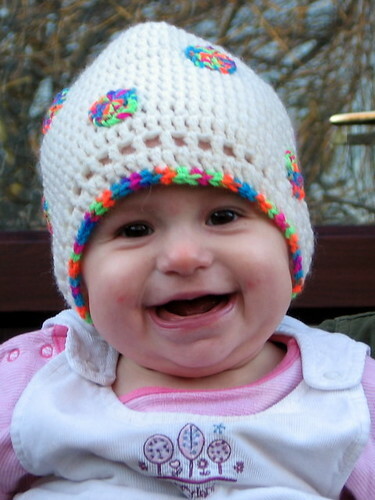 Having successfully crocheted three hats and discovering in the process how easy they were, I decided it was time to make a new hat for M. After all, the ones I'd bought were only sized to six months, so I knew that she'd need another one - what more in the way of an excuse did I need? I eventually found some yarn to my liking. Wendy Mode DK is a 50% Merino Wool, which is deliciously soft, had no scratchiness at all and was machine washable. 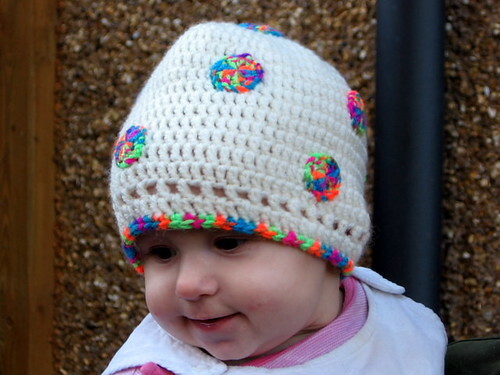 The high wool content should mean it is nice and warm, while DK is a good weight for a baby's hat. White seems a nice traditional colour for a hat, but I decided I wanted to jazz the final result up with a little surface decoration, so I dug out a brightly coloured, very loud acrylic which normally shouts from across the other side of the room. I swatched for a bit and decided to work a little tighter than I normally would with a DK weight yarn, opting for a 3.5mm hook which gave me a guage of 17 stitches x 11 rows = 10cm square worked in trebles - note I'm using British notation here! Once I'd decided the guage I wanted to work at, it was just a case of doing the maths and aiming for a hat that would be a little too big since I wanted it to last this winter and if possible take us into the next. After sneakily measuring M's head whilst I distracted her with a sock, I worked out that I needed to aim for approximately 70 stitches at the brim, giving a circumference of approx 40cm (16 inches). Armed with this knowledge, I decided to start with a circle of 10 stitches and increase up every row until there were 70. 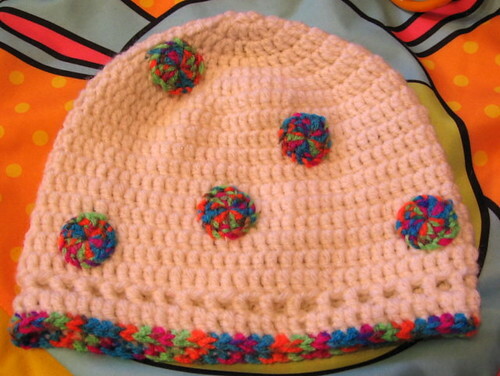 I put row of eyelets at the brim before adding a round of doubles in my chosen contrast yarn. Finally, I made up ten spots or jewels, each made up of twelve trebles joined in a circle. In each case, I used the loop method to start and left the tails long, using them to secure the jewels to the hat, arranging them in a random fashion. And this is the result. M very kindly helped throughout the project, testing the yarn for potential felting hazzards and confirming that it was very tasty as well as squidgy soft. She has also decided that she wants her own crochet hook and wants to play with string just like Mummy. Having taken a keen interest in progress on her hat, M was more than happy to model the final result and here she is, the proud owner of a new hat. The contrast yarn works well and in very small amounts, this exceptionally loud yarn is considerably subdued working to complement the creamy white of the main colour. The hat is slightly too big, but not so huge that M can't get any wear out of it this winter and as far as I can tell, there is no scratchiness to irritate very delicate skin. 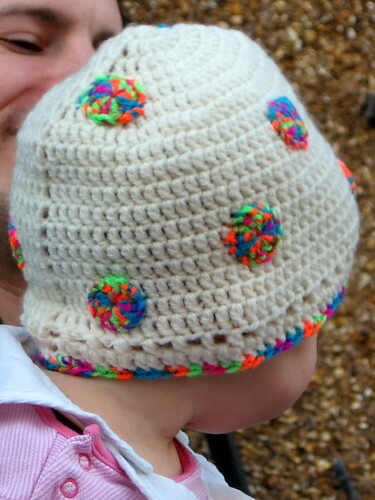 The hat used very little yarn, taking about 3/4 of a ball of the Mode, which according to Ravelry is approx 100m or so. I used a tiny amount of the contrast colour, scraps really, meaning I still have a few balls of this stuff to get through, so it may be featured here several times in years to come. Very Nice, she looks very happy in it. A hat worthy of my collection, although I don't think its my colour or size, so M's hat is safe.